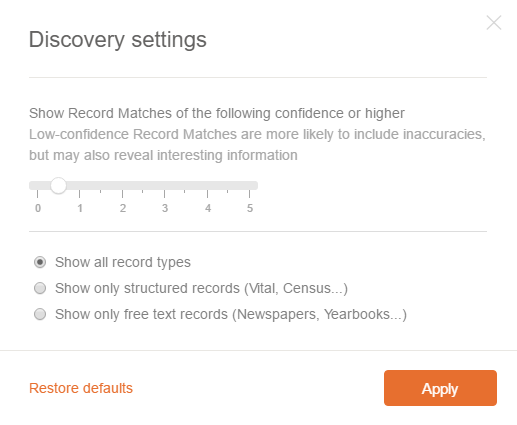 We’re excited to introduce our new and improved Discoveries pages, that provide Smart Matches and Record Matches. The new pages are easier to use, more consistent, and they work well also on mobile devices. The new pages are much faster, too. We are presenting here a very comprehensive description of the new pages. We recommend that you take the time to review it, as the information below can arm you with useful knowledge that will help you make the most of your matches and unlock the full power of the MyHeritage platform, to improve your family history research. We’ve unified all matches and organized them into two main pages: Matches by People and Matches by Source. Now you can look at all matches that were found for a particular individual in your family tree, or all matches found in a particular collection of historical records or matching family tree. Whatever you choose to use, the new pages combine Smart Matches (matches with trees) and Record Matches (matches with records) into the same unified and consistent interface. However, you can still decide to view only Smart Matches or only Record Matches and not both together. This is much better than the previous organization, where Smart Matches and Record Matches were entirely separate sections on the website, and you had to look at each one of them separately. The historical reason for that separation was that Smart Matches were developed first and Record Matches were released several years later. Now we’ve gone back and unified the experience of using both. Access the new pages via the Discoveries drop-down menu in the main navigation of your family site. 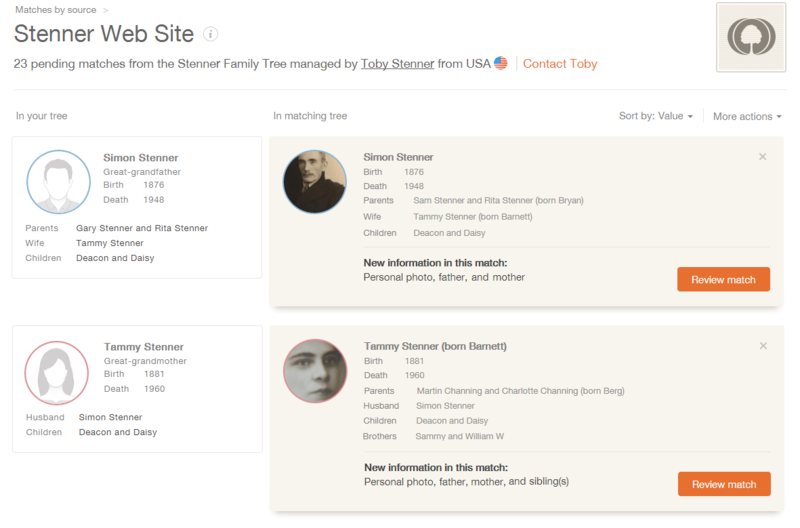 Smart Matches and Record Matches can also be accessed directly from your family tree. Family tree cards will display a green icon if Smart Matches have been found for an individual and a brown icon for Record Matches. These green and brown icons will be displayed for every individual who has matches. As you enter information into the tree, new matches will be found in real-time, and you will be alerted about them with a flashing icon. This page displays all the people in your family tree, who have Smart Matches and/or Record Matches. Sorting ensures that the people having matches that can bring the most incremental and useful information to your family tree are listed first. This way you won’t waste time looking at matches that don’t add value. Click any of the orange buttons to view the matches of a particular person. This page displays all the collections of historical records and all family trees that contribute matches to your family tree. In this context, we refer to each one of them, a collection or a tree, as a Source. Sorting lists the collections and trees that contribute the most matches, first. You can easily filter to view only Record Matches or only Smart Matches. Click any of the orange buttons to view the matches coming from a particular source. 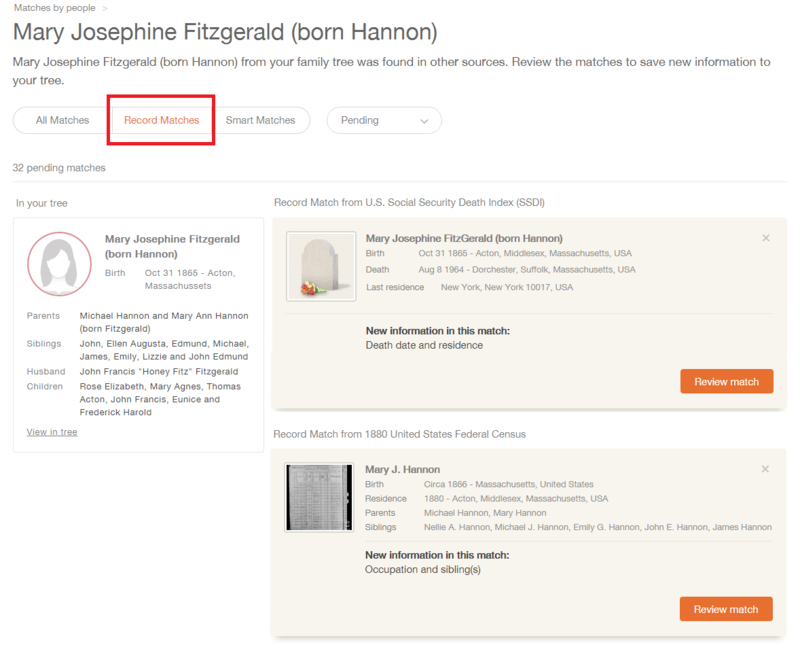 For example, it is very convenient to view the matches from the BillionGraves collection of headstones, and then proceed to save the records to your family tree. This is a topical approach (by collection) that many genealogists prefer, that is not available on other genealogy services. 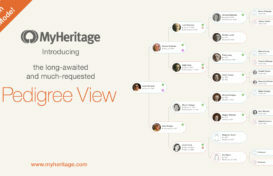 MyHeritage has invented a unique and very useful concept in matching that describes the incremental information that any match can add to your tree. We call this “Value Add.” For example, if an individual in your family tree matches a historical record such as a Social Security Death Index record, and you don’t know the individual’s date of death, but the record has it, the Value Add will include “Death date.” A Value Add factor can be partial. For example, if you know an individual was born in 1928 but the record states the birth date as July 28, 1928, and there is no contradiction, the Value Add factor will be “More complete birth date”. In this manner, we have developed about 15 Value Add criteria, and they are all useful for describing what new and incremental information a match (or set of matches) can bring your tree, that you currently don’t have. A Value Add can even be a new personal photo or a new family member (such as father, mother, sibling, spouse or child) that your family tree lacks. Matches are now sorted by the Value Add so that those matches that add the most value are listed first. In the past, matches were sorted by how confident we were that they were correct. We were listing matches that we were very confident about at the top of the list, but typically those matches didn’t provide much new information. If we were certain they were correct, that meant they were matching many fields and information that you already knew. So, in fact, we were listing less-exciting matches at the top of your list. They were correct matches, but less interesting for you! The new sorting by Value Add ensures that the matches that can teach you the most – those that are the most exciting – are listed at the top of your matches. This saves you valuable time and allows you to focus your limited time on the matches that are potentially the most valuable. Every match now describes the Value Add as “New information”. In the example below, the Record Match from the collection “Biographical Summaries of Notable People” offers many pieces of new information such as a middle name, residence, education, father, mother, siblings, and children, that are all missing in the user’s family tree. Please note that a match can be useful even if it brings no new information, for various reasons. For example, it can verify information you already know. Or, a Smart Match that brings no new information can still allow you to get in touch with a relative you may not have known about — the owner of the matching tree. So don’t skip the matches that have no Value Add. When you’re viewing the matches of a particular person or a particular source, you can click “Review match” to zoom in on any of the matches and see all its details. Reviewing a Smart Match conveniently compares the information about the person between your tree and the matching tree, side by side, and shows you what is new or different in the other tree. We also added a visual family tree comparison of the close family so you can easily see the difference between the two trees. and decide whether the match is correct or not. Thanks to the accuracy of our matching technologies, you will find that almost 99% of the matches are accurate, spot on! If a match is indeed correct, click the “Confirm Match” button to confirm it. If a match is incorrect, use the “reject it” link at the bottom of the record. After confirming a match or saving information to your family tree, you can always go back to a match at a later point and extract additional information manually. Viewing Smart Matches is free. To confirm Smart Matches or contact the owner of a matching tree, a Premium or PremiumPlus subscription is required. Viewing the list of Record Matches is free, but viewing the details of a Record Match, confirming it or saving information from a Record Match to your tree, requires a Data subscription. Because of the different subscriptions involved, we recommend the Complete subscription plan which combines PremiumPlus and Data and is discounted. If you have a Complete plan, you will have unlimited access to all types of matches and all Instant Discoveries, as well as full access to the 7+ billion historical records on MyHeritage SuperSearch. We suggest that you review your matches systematically, confirm the correct ones, and reject the bad ones. Don’t stop there — make sure to save the data and extract any new information to your tree. As a working method, either go to “Matches by people” and go over the matches for people in your tree that you care about the most, and add new information for them; or – and this is unique to MyHeritage – go to “Matches by source” and go over matches by the collections and matching family trees that seem the most important to you. We recommend that you go over all your pending matches and confirm or reject them until there are no pending matches left. This way once new matches are found, you will quickly see them listed as pending matches. You may notice that the new pages don’t allow confirmation of matches displayed in a list until you review them individually (bulk actions are still supported, see further below). This is intentional because we’ve noticed in the past that some users confirmed their matches but don’t save new information into their tree, which defeats the purpose of having matches. So the new pages require matches to be reviewed before they can be confirmed, and following a confirmation, the system proceeds to help you save information from the confirmed match to your tree. When viewing Smart Matches, you have the option to contact the site manager of matching family tree or invite them to your family site. We recommend taking advantage of this because by getting in touch with the other user you may discover more information that they didn’t enter into their tree. After saving information to your tree, you are given the option to visit that person’s profile to see all the new information just added. Through enhanced weekly emails, we will notify you when you have new pending Smart Matches or Record Matches, with new information that can be added to your family tree. Here is an example of a weekly update about new Record Matches, with options to review each match, and to view all matches for that tree. This is similar to notification emails we had in the past, but the new emails list the Value Add, i.e. the new information that each match can add to your tree, and the new emails also look much better when viewed on mobile phones. The weekly Smart Match email also includes the Value Add information. It offers the option to review new pending matches and to view all matches for the tree. Use the drop-down boxes to filter matches by Pending, New, Confirmed or Rejected matches, and to view matches for all your family trees or for just one tree (in case you have more than one in your family site). Click the settings icon (cogwheel) to open the settings page. The Discovery settings allow you to view Record Matches of only a certain confidence or higher, and to choose which types of record to show. If you would like to change the settings, we recommend that you switch back to the default settings later. When viewing only Smart Matches (by people or by source), you can choose to confirm all or reject all matches that are currently displayed. Rejecting matches via “Reject all” is useful in case you notice that all of them are wrong. Confirming many matches via “Confirm all” is not recommended because it will not take you through the path of extracting information from each match, which is available only when you confirm matches one by one. Use “Confirm all” only when there is no Value Add and you want to simply confirm the matches and get them out of the way without taking any other action. When viewing matches from another MyHeritage family tree, you may also ignore all future matches from that specific matching tree. This is useful in case this tree is known to you and doesn’t contribute anything you don’t already know. It will save you time by getting all the matches from that tree out of the way. We have provided the option to change the sorting criteria for matches, which may be useful for advanced users. Matches by people are sorted by Value Add by default, allowing you to make the best use of your time by first reviewing the matches with the highest value first. However, you may also sort the people listed by the number of matches, first names, last names, or relation to you, by choosing an option from the drop-down menu. Matches by source are sorted by default by the number of matches that each source has. You may also sort your matches by source name or site manager. Click the magnifying glass in the right-hand corner to search for a particular person or people in your list of Matches by people, and view only the relevant matches. We’ve been rolling out the new Discovery pages to our user base gradually, so it’s possible that you’ve already seen them. We’ve been doing it gradually for almost a year in order to collect feedback and suggestions from our loyal customers and implement them, to ensure a smooth deployment for the majority of our users. We have now completed moving everyone over to the new pages. We are still enhancing the new pages, and one of the features we are still working to add is the Consensus page (aggregated display of information from multiple Smart Matches) that we had in the old match pages. We hope that you’ll enjoy using the new pages and find them to be faster, friendlier and more useful, helping you enrich your family tree with the wonderful information that MyHeritage has to offer. 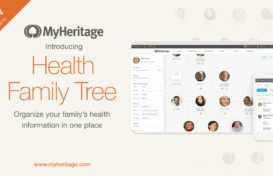 I’m a new member to MyHeritage. Started late November 2016, then joined beginning January 2017 as active member. Doing everything from my phone an enjoying every moment I’m active. I’m like a kid with a new toy, exploring the world. Thank you MyHeritage for making it possible. I love your site, and there is only one thing that would make it much more friendly for me, and that is to let me have user control of the background colors for each individual in my tree. This would allow me to easily recognize someone that in in the tree that is a relative, but not directly associated with the root tree. Glad to hear that you’re enjoying using MyHeritage, and thanks for the suggestion!